January–the season of New Year’s resolutions and good intentions. Many of us vow to change our lifestyles at the beginning of each year, signing up for a gym membership and making promises to stick to strict diet plans. But what do those resolutions look like 11 months later? For many people, they fall apart. Andy Pudlowski was no exception. In the past, he’d join “big box” gyms at the start of each year, but by the time spring rolled around his commitment would fizzle. “I wanted something with a little more staying power,” Andy says. 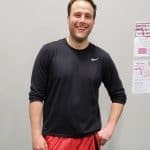 Just after Christmas, at the beginning of 2018, Andy did some online searching and came across Pursuit Fitness and Performance (PFP). He realized that this gym was very close to his home and seemed to have a different mindset from the previous gyms he’d belonged to. He decided to give it a try, also committing to PFP’s “Foundations 4 Life” program to work on his nutritional habits, as well. Andy loves the “teamwork vibe” of the group during his group training sessions, which he tries to attend 2-3 times each week. “Everyone lifts each other every, single workout,” Andy says.